Artists have often depicted the Cardinal Virtue of Prudence, Sapientia, as a marine animal roaming the depths of the sea. This is likely due to the human disposition to characterize the sea as the source of all life, a veritable fountain of prudence and wisdom. It is also though that Sapientia is responsible for the rise and fall of the tides, and natural phenomena such as tsunamis. 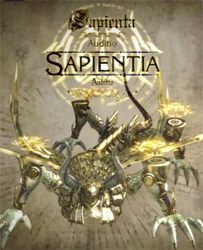 The grand idea that the living seas could be nothing other than Divine Will at work is actually evidence of Sapientia's narcissism, even amongst the other Cardinal Virtues. When a man born as a slave led his people to freedom from ruling oppression, it is said that it was only Sapientia's favour that parted the seas and allowed for their escape. yoshesque: I'll just leave this here. 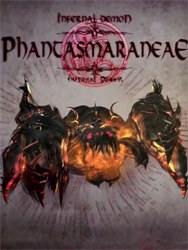 Phantasmaraneae nests upon a sea of magma, deep within the furthest reaches of Inferno. Rarely seen upon the face of the Earth, even sightings of the demon in hell are a seldom event, leading to its name, which means phantom spider. While having the frightening appearance of a spider, it is a curious beast, and should one have the good fortune to encounter the Phantasmaraneae, one should treat it with care and respect, in hope of receiving rare treasures and secrets in return.